To the pilot transitioning into jet airplanes, going faster is seldom a problem. It is getting the airplane to slow down that seems to cause the most difficulty. This is because of the extremely clean aerodynamic design and fast momentum of the jet airplane and because the jet lacks the propeller drag effects that the pilot has been accustomed to. Additionally, even with the power reduced to flight idle, the jet engine still produces thrust, and deceleration of the jet airplane is a slow process. Jet airplanes have a glide performance that is double that of piston-powered airplanes, and jet pilots often cannot comply with an ATC request to go down and slow down at the same time. Therefore, jet airplanes are equipped with drag devices, such as spoilers and speed brakes. The primary purpose of spoilers is to spoil lift. The most common type of spoiler consists of one or more rectangular plates that lie flush with the upper surface of each wing. They are installed approximately parallel to the lateral axis of the airplane and are hinged along the leading edges. When deployed, spoilers deflect up against the relative wind, which interferes with the flow of air about the wing. [Figure 15-18] This both spoils lift and increases drag. Spoilers are usually installed forward of the flaps but not in front of the ailerons so as not to interfere with roll control. Deploying spoilers results in a substantial sink rate with little decay in airspeed. Some airplanes exhibit a nose-up pitch tendency when the spoilers are deployed, which the pilot must anticipate. 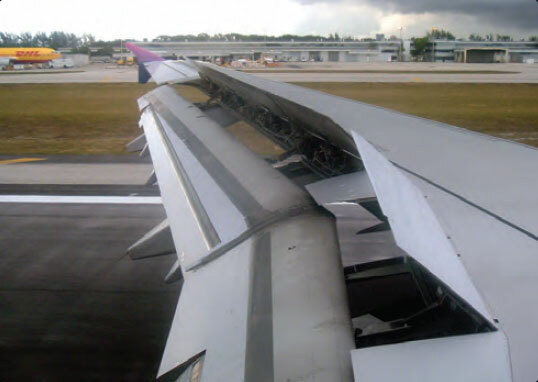 When spoilers are deployed on landing, most of the wing’s lift is destroyed. This action transfers the airplane’s weight to the landing gear so that the wheel brakes are more effective. Another beneficial effect of deploying spoilers on landing is that they create considerable drag, adding to the overall aerodynamic braking. The real value of spoilers on landing, however, is creating the best circumstances for using wheel brakes. The primary purpose of speed brakes is to produce drag. Speed brakes are found in many sizes, shapes, and locations on different airplanes, but they all have the same purpose—to assist in rapid deceleration. The speed brake consists of a hydraulically-operated board that, when deployed, extends into the airstream. Deploying speed brakes results in a rapid decrease in airspeed. Typically, speed brakes can be deployed at any time during flight in order to help control airspeed, but they are most often used only when a rapid deceleration must be accomplished to slow down to landing gear and flap speeds. There is usually a certain amount of noise and buffeting associated with the use of speed brakes, along with an obvious penalty in fuel consumption. Procedures for the use of spoilers and/or speed brakes in various situations are contained in the FAA-approved AFM for the particular airplane.